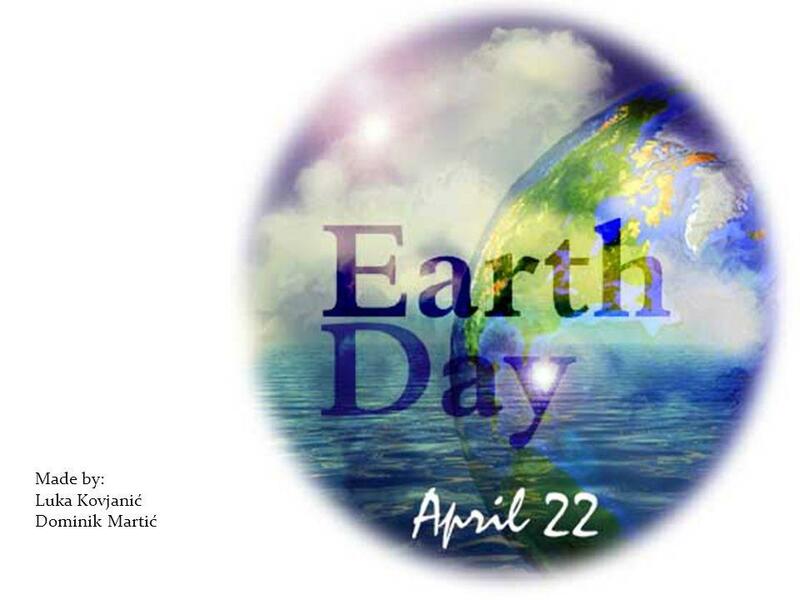 2 Earth Day is an yearly event, celebrated on April 22nd, on which events are held worldwide to demonstrate support for environmental protection. It was first celebrated in 1970 and celebrated in more than 192 countries each year. 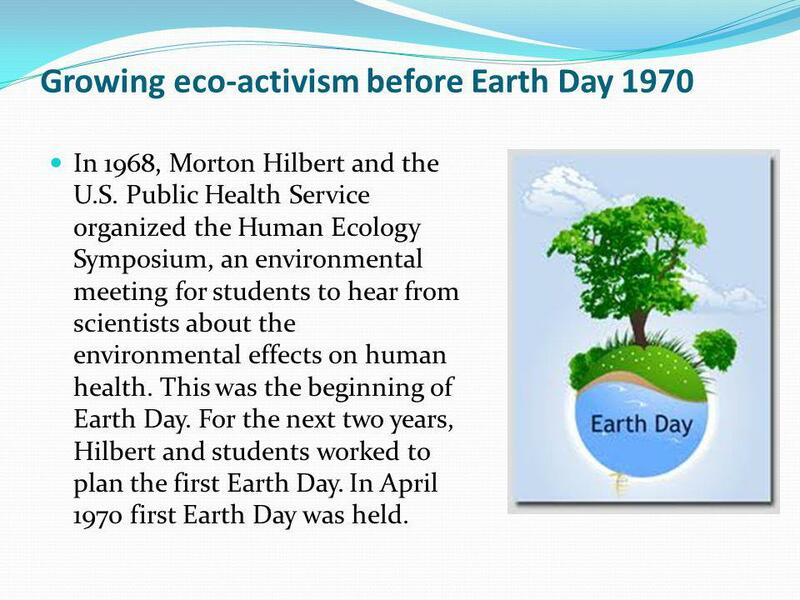 In 1968, Morton Hilbert and the U.S. Public Health Service organized the Human Ecology Symposium, an environmental meeting for students to hear from scientists about the environmental effects on human health. This was the beginning of Earth Day. For the next two years, Hilbert and students worked to plan the first Earth Day. 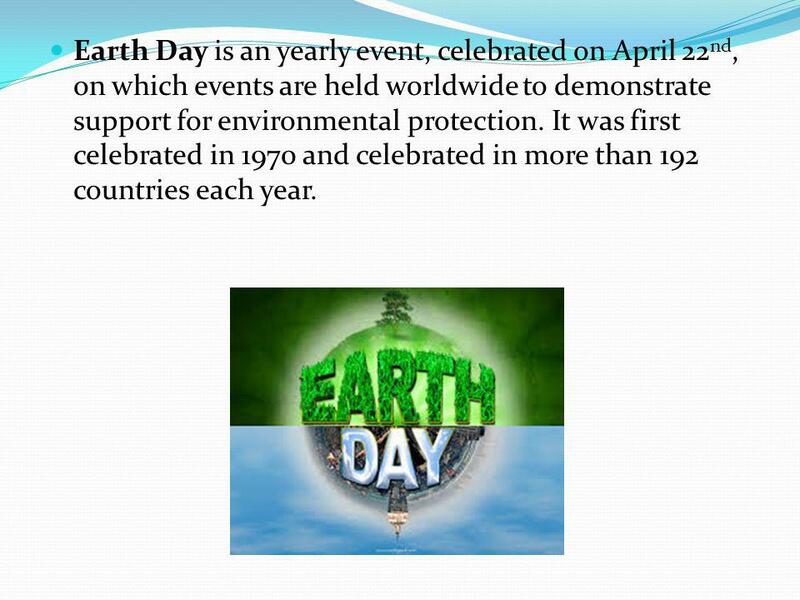 In April 1970 first Earth Day was held. 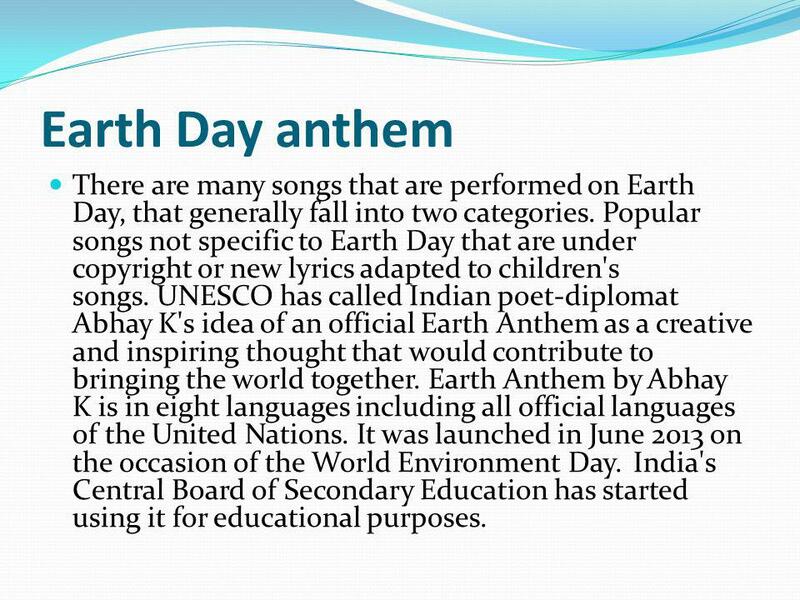 4 Earth Day anthem There are many songs that are performed on Earth Day, that generally fall into two categories. Popular songs not specific to Earth Day that are under copyright or new lyrics adapted to children's songs. UNESCO has called Indian poet-diplomat Abhay K's idea of an official Earth Anthem as a creative and inspiring thought that would contribute to bringing the world together. Earth Anthem by Abhay K is in eight languages including all official languages of the United Nations. It was launched in June 2013 on the occasion of the World Environment Day. India's Central Board of Secondary Education has started using it for educational purposes. 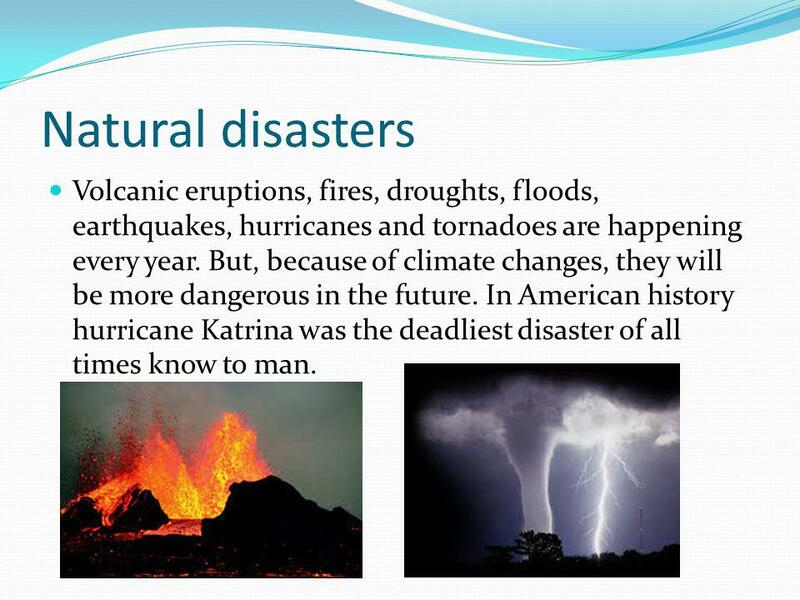 5 Natural disasters Volcanic eruptions, fires, droughts, floods, earthquakes, hurricanes and tornadoes are happening every year. But, because of climate changes, they will be more dangerous in the future. In American history hurricane Katrina was the deadliest disaster of all times know to man. With help of new technology, terrorist organization are becaming more powerfull and dangerous threat to all people. So if in USA it’s not safe how can it be here if they attack? Nuclear power is one of the cheapest sources of energy, but its disposal of radioactive waste has very harming effects on people. AIDS is a worldwide disease caused by virus HIV. It’s mostly spread in Africa. It can’t be cured but you can get drugs to expand your life. 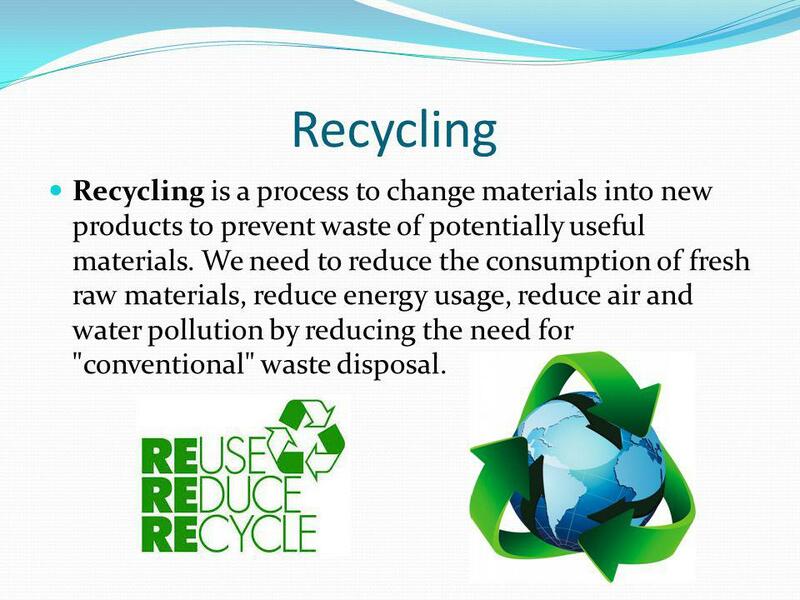 8 Recycling Recycling is a process to change materials into new products to prevent waste of potentially useful materials. We need to reduce the consumption of fresh raw materials, reduce energy usage, reduce air and water pollution by reducing the need for "conventional" waste disposal. 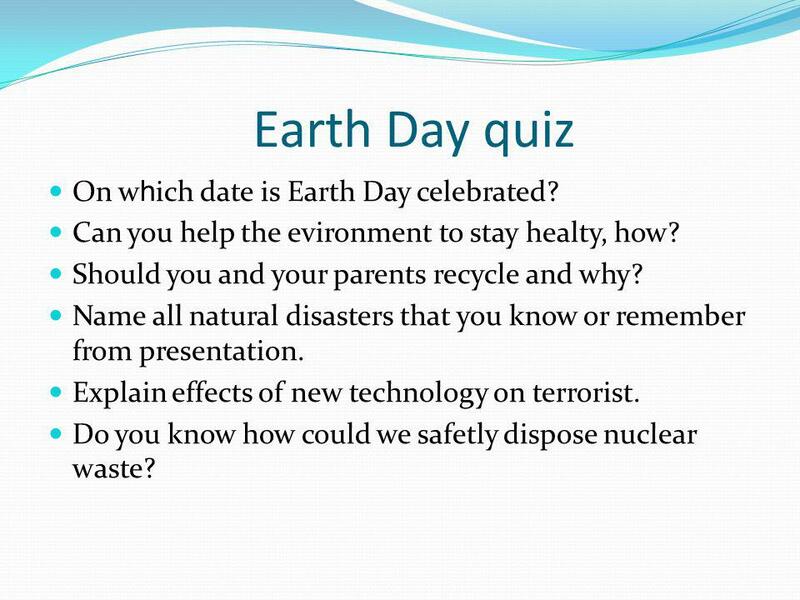 9 Earth Day quiz On which date is Earth Day celebrated? Can you help the evironment to stay healty, how? Should you and your parents recycle and why? 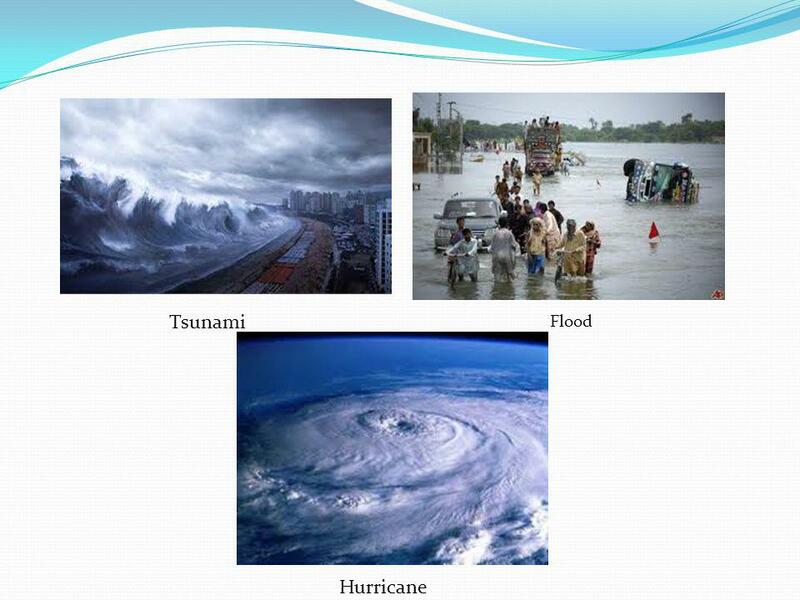 Name all natural disasters that you know or remember from presentation. Explain effects of new technology on terrorist. 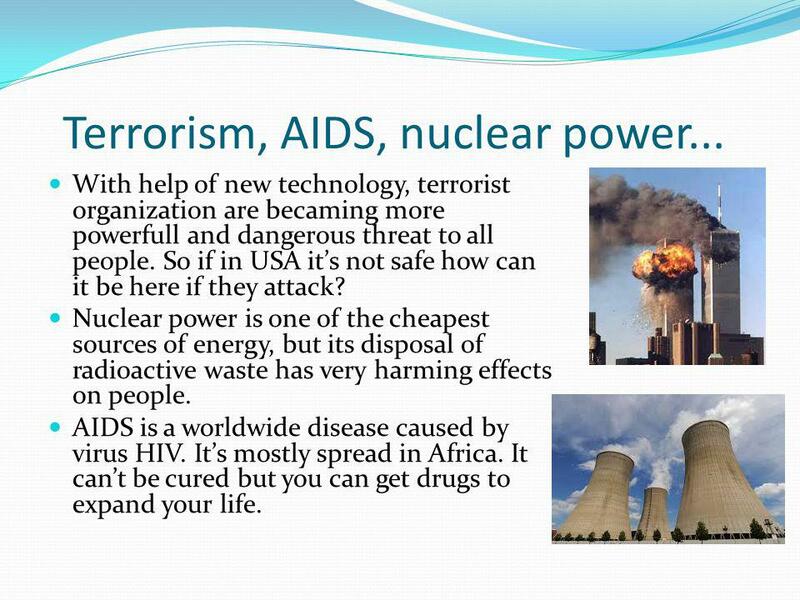 Do you know how could we safetly dispose nuclear waste? Download ppt "Made by: Luka Kovjanić Dominik Martić"
Learning Circle Project My City and Me Ecology of the city (Final project) "A chain is no stronger than its weakest link, and life is after all a chain."A. Ecology in our school We take part in the Comenius project. 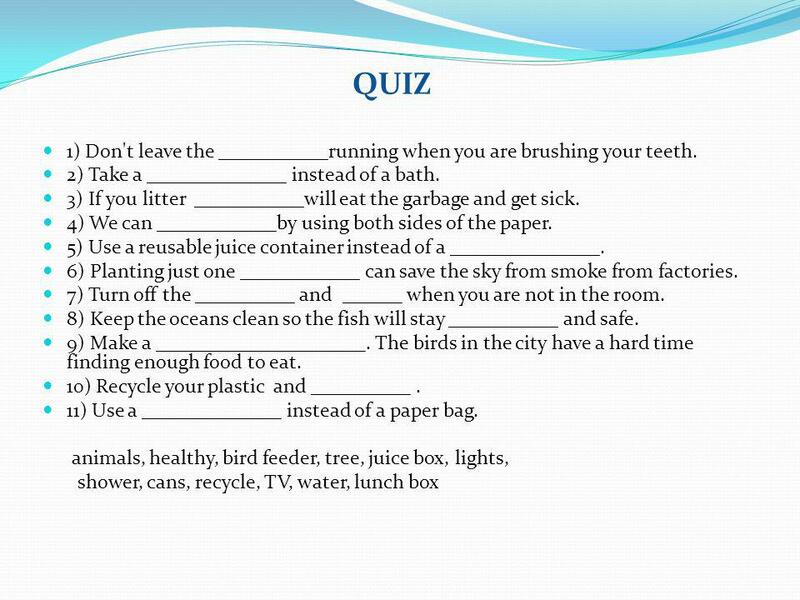 Ecological problems in our country Done by MIDUKOVA OLGA PAVLOVNA 2013 SCHOOL №6, SHUMERLYA. With the day of Earth!!!. DO DON’T SOMETIMES Recycle plastic, metal and glass. UNIT ONE Part Two Everything is Connected. Investigating Interactions  Geography is all about Interactions  Interactions are influences that people. By: Bailey LITTERING  It harm the environment by throwing it on the ground.  It kills a lot of plants and animals in the metro parks.  It sometimes. We must take care of our home, the Earth.. Air pollution Water pollution Noise pollution. Home Energy Do’s and Don’ts. Always turn off the TV when you leave a room. How can people protect natural resources?. The three Rs To reuse: is to use a resource again. To reduce: is to use less of a resource. To recycle: to. 3 rd Grade Edition Fall 2012, Version Earth’s. ECOLOGY ALZHIROVA IRINA FORM 11”A”.